DDV #50 - its the 50th podcast! Dave made it to 50 shows. I take a few moments to reflect on my past shows, and ask for your input on the future. Plus, I am proud to announce my new site disneypodcast.net, which I hope will become a community site for great content. And, I talk about the upcoming Disney Scavenger Hunt. On this week's show, I've got Disney news to share. I talk about the end of grad nite, a special event for high school seniors. I attended as a senior and worked it as cast member, and remember it fondly. I talk about the possible new DVC property that will be at Disney's Grand Floridian. Then its on to Star Tours 2.0 that will open in time for Star Wars weekends. I have a couple of quick takes on happenings, and then I get to a few interesting rumors involving the queue at Peter Pan - which likely will be getting an interactive makeover, the Tiki Room which is rumored to be going back to its original show, and a rumor about the Universal Studios. After Mickey's 60th birthday was over, Disney decided to re-theme Mickey's Birthdayland as Mickey's Starland. And later, it became Mickey's ToonTown Fair. I explore the changes that were made, and how the land evolved over time to become what we saw before it closed. With the removal of ToonTown, I wanted to pay tribute to the original idea and how it came about. Mickey's Birthdayland was created to celebrate Mickey's 60th birthday and was only supposed to be be temporary. 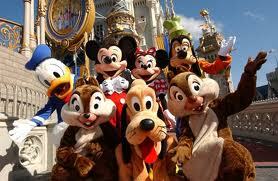 But it was fairly popular, and Disney realized that guests wanted to meet Mickey, and so expanded on the idea. I talk about this new land, and what it was all about. Please feel free to add your comments! I actually do love to answer questions about Disney. Its fun to help others plan so they can enjoy the resort as much as I do. This podcast contains questions about miniature golf (cough! cough! be sure and check out my app in the itunes store), whether to stay on property or off, photopass, which fireworks show is the best, and a question about gay days in the parks. I also present an idea from a listener who suggests what you can say to CastMembers in each country in EPCOT. Discuss below! You've heard me talk about playing miniature golf on my podcast. I decided to make a fun little app so you can throw away those little pencils and scorecards. And do something more. The app allows you to keep score of your mini golf game, save the scores for review, see the places you've played on a map, take photos without leaving the app - and best of all it allows you to be social: you can post pictures and notes to facebook and twitpic while you're playing! In this podcast, I talk about why I think its so special. What makes the parks unique? What makes the experience unique and interesting? How is it different from the other competitors? On this pair of podcasts, I delve into what its like to go solo at Walt Disney World. But being the non-conformist that I am, I had to be somewhat ironic and have a guest on. Yes, the two of us team up to talk about going to Disney solo. The humor is not lost on me! I've got a full slate of news for you on this episode: there's news about Walt Disney's 40th, the Disney-sponsored scavenger hunt, the Fantasyland expansion, and much, much more! Dave's back as a Disney dad! Camping, a breakfast dining question, what to do with one day in the park, and more! The denouement. As I visited the last time, I had some thoughts about some of the goods and relative bads of Disney World. I share a number of those thoughts with you. But - I still love Disney, so I make every effort to tell you why and what Disney does to counter those bads. Part 2: I head over to the Magic Kingdom and ride a few attractions, and naturally have some stories to tell. Back around halloween of 2010, I took a trip to Disney. I present to you a multi-part podcast that captures the trip. I talk about Jim Henson. I was a huge fan, and loved seeing his thought process and creativity. I explore his relationship with Disney, and talk about a personal experience with one of his associates as a kid in school. And I talk about the traveling exhibit I saw in 2009. What's not to love about Disney Holidays? In this podcast, I talk all about the 2010 happenings. The Walt Disney World resort takes on a special nature to it during the holidays. Every so often, people ask me a question about Disney. I decided to start a recurring topic wherein I answer many of those questions. Think of me as a Disney dad. This podcast takes a look back at some of the early Jack Wagner monorail spiels. I found some of his original recordings and play them for you here. Enjoy! I take a long look at the monorail, its history, and share some interesting pieces of information about the fleet and the loops. Its one of my favorite machines, so I thought I would give it its due. was a hoot, and I hope you consider doing something similar. had the teams doing. Feel free to take it and make it your own!!! Its the fifth and final part of my "quest for food" as I tried to get to every restaurant on Disney property in the early 1990s. This segment focuses on EPCOT, and tis dining establishments. And I summarize my overall results. We're winding down the quest for food. In this episode, I wander through all the other hotels in Walt Disney World - the Carribbean Beach, Yacht and Beach Club, Dixie Landings, Port Orleans and Fort Wilderness; we also made it over to Downtown Disney. We were nothing if not thorough!! In this episode, I continue the tour with a trip through the Magic Kingdom's various eateries. As you might have guessed, I have tried them all, but missed one on the quest for food. Back in the early 1990s, a friend and I wanted to try every restaurant on Disney property. It turned out to be more, and I tell you about it in a series beginning with this episode: the monorail resort loop. I loved Pleasure Island back in the early 1990s, and went there often. This week, I took a look back at what it was, how it was laid out, and explore the various clubs within it. Come take a trip with me down memory lane. In the final part of this series, follow along as I resort hop. I visit each of the hotels on the monorail loop, stop for breakfast at Chef Mickeys, head over to the Wilderness Lodge and check out some of Walt's trains. Plus, I spend some time looking for a brick in the "walk around the world"
On our last day, we did some resort hopping. But....before we get to that, I bring you the simple pleasure that is the monorail. We rode the resort loop around to each hotel, and I recorded the entire ride. Incidentally, we happened to be on monorail teal. Enjoy! In this episode, I take a day trip to Kennedy Space Center, but make it back in time for the Campfire Movie and fireworks at the Magic Kingdom. The week before easter, I went camping at Disney. Come along with me as I go to a spring training baseball game, head over to Boma, and take a stroll around Downtown Disney. DDV #10 - What is EPCOT?